You're so lucky to have all those fresh figs in San Diego. I made your fig and rosemary cake last year and it was a HUGE hit! 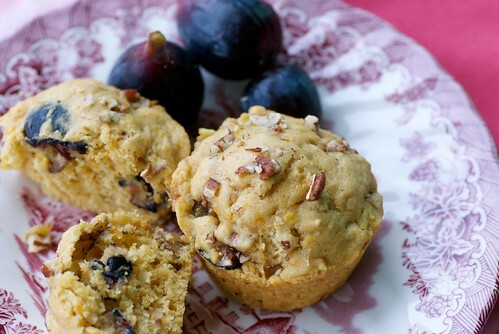 Do you have a recipe for fig muffins? I'm having my parents for brunch this weekend and want to make something easy with figs. Thanks so much! I didn't have a recipe for fig muffins. But how do say "no" to a reader who loves your recipes and wants to make muffins for her parents? You don't. You create a recipe. So, here it is: Fresh Fig, Orange, and Pecan Muffins. I don't know what's better about making these muffins, the sweet, citrus smell that floats through the house while they're baking or the soothing warmth of a buttery soft, fig in your mouth. You decide. Just call me Fig Blogga. These muffins are made with white whole wheat flour which makes them light in color yet equally nutritious as those made with tan colored whole wheat flour. 1. Place rack in center of oven and preheat to 375 degrees F. Spray a 12 mold regular size muffin pan with cooking spray. 2. In a large bowl, combine flour, sugar, baking powder, baking soda, and salt. 3. In a separate bowl, whisk together melted butter, egg, buttermilk, orange juice, orange zest, and vanilla. Add to the flour mixture and stir quickly until well combined. Fold in the figs and pecans. Spoon the batter evenly into the 12 molds. Sprinkle with reserved 2 tablespoons of pecans. 4. Bake for 18-20 minutes, or until the tops are golden and a cake tester inserted into the center of a muffin comes out clean. Transfer the pan to a rack to cool for 5 minutes before removing. Wait, here are more fig recipes! You're on a roll with the delicious fig recipes. My brother Rand brought me some figs from California and I just cooked figs yesterday for the very first time. Oh heaven. Too bad there are no figs in Utah! Do you know that I dragged my better half to grocery stores all over Eastern Nebraska this weekend looking for figs, and found nary a one? NOT ONE. Dude, that's just. So. Wrong. Anyway, I'll bookmark this recipe with the rest, and keep my fingers crossed for a fig to pass my way at some point before the season is over. I did spot the first quince today, so maybe we're soon to have figs. Haha love it! You should never say no to new fig recipes. Or requests for new fig recipes. Or any excuse to eat figs. these sound delicious! I love the orange/pecan infusion. So delicious! I should hurry and make them before fig season is over. Great that they're made with wholesome whole wheat. Yes you are lucky to have all of those wonderful figs in California. I have had a hard time sourcing them this year. I am breathing in deeply to smell your muffins baking. Wow, these do sound delicious! I really want to try these out. Thanks for posting this! I have a fig tree in my yard and always want to try new recipes with the figs. When I look around online most of the recipes call for dried rather than fresh figs. I'll definitely try these muffins! You're awesome!! Making a whole recipe because a reader wants it :) These look awesome!! And I think you should be more than happy to be known as "Fig Blogga." These look fabulous... Keep the fig recipes coming! I am always looking for fig recipes since I have a friend with a tree & we get more than we can handle. These muffins sound delicious! Do you think I could substitute regular whole wheat flour for the white whole wheat? goody- Awwww. I wish I could send you some, but they're so perishable, they'd never make it. Have you tried an online source like Melissa's? joanna-"No" and "figs" don't go together. Yummy Yummy Yummy, I am always trying to get my kids to eat different. Not hard to get them to eat this. Loved them. jackie-I know. That's why I cook and bake with fresh ones as much as possible! shipwreck- Yes, you could, but they will come out a bit darker. What a perfect muffin! Never tried figs before but yours sounds healthy and delicious, must hunt for figs now..
My fig tree now has one single lonely fig growing - lots of leaves (which is promising). I can't wait for a glut of figs so I can start making your fig creations. I just had a coworker walk by my computer and saw the muffin photo and she had to stop and read the recipe with me. They look so tasty with all of the nuts and fruits in there. Ha! I'd have caved w/ that sweet request too. I absolutely love figs. Bought a basket of them at TJ's the other day and ate them simply w/ gorgonzola & honey. Muffins sound perfect. What a wonderful mixture of great flavors. These seem to be the prefect transition from summer to fall. I find that when I start cutting the figs, quite a few jump right into my mouth! How about you? I love figs...they're so fleeting in the stores though! And even more difficult to find at the farmers markets around here. Lucky you! And these look great.